Nucky, under jockey Salvador Martinez, was an easy winner Sunday afternoon in the Grade 2 West Texas Futurity at Sunland Park. 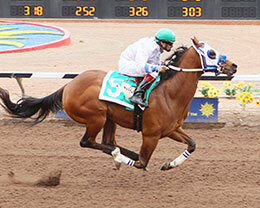 SUNLAND PARK, NM�APRIL 12, 2015�Fastest qualifier Nucky, made easy work a full field of two-year-olds in the 57th running of the Grade 2 $198,924 West Texas Futurity at Sunland Park on Sunday. The bay gelding broke alertly under jockey Salvador Martinez easily moved to front and finished three-quarters in front of Pampered Jess. Tf Im That Guy finished a neck behind in the third. Saddled by trainer Justin Joiner, Nucky completed the 300 yards in :15.052 seconds to pocket the winner's purse of $93,494. Racing for owners Denis and Julie Schoenhofer, Nucky entered the race as the fastest qualifier from seven trial races on March 20. Bobby D. Cox bred the gelding by first crop sire DOMINYUN in Texas. Out of the Southern Cartel mare Southern Brook, a half-sister to stakes winner Dianetobewitcha and Dianetogetcha, the dam of first crop sire Freighttrain B. The second dam is the G3 winner Dianetomeetcha by Special Show. Nucky, who is now 2-for-2 and has earned $98,594, went off as the post-time favorite and paid $6.40 to win, $3.60 to place and $3.40 to show. Pampered Jess showed late interest to finish second and earn $35,806. Alfredo Sanchez owns and trains the $10,000 Heritage Place September Yearling Sale graduate. Third place finisher Tf Im That Guy stepped up from his fourth place effort in the Nucky's fastest qualifying time trial to finish third for owner Victor Diaz. Eliseo Gonzalez trains the California-bred who earned $21,882 for today's effort. Completing the official order of finish were Fine Oak Corona, Belvedere, Endless Affair, Rbj Strawfly Cartel, Ashotofliquidcourage, Paquena I Love You and Dig This James.